A large part of the many tourists in Vienna take part in a city walk or a city tour. There are different companies offering such tours. In the following we want to present some good offers. We have selected city walks that have received good reviews from participants on the internet and are not too expensive. A very good, classic city tour through the city centre, bookable on the Internet on this website. You walk in a group through Vienna. The guides on this tour are very informative, educated and have a sense of humour. Questions are answered gladly and competently. You see the classics like Hofburg or the famous Cathedral Vienna. Further szops of this city tour are for example the famous Blutgassen quarter or the white horses of the Spanish Riding School. We particularly liked the short visit to a typical Viennese coffee house. It’s a great city walk with lots of information. We consider this city tour particularly recommendable at the beginning of a trip to Vienna. You get a good overview. The tour is only in English, no annoying multilingual tour. The participation costs 16 Euro (in the beginning of the year 2018), children under 14 years pay half. As far as we know, the starting time is all year round daily at 14.00 o’clock. You can book this city tour on the Internet and cancel it free of charge with the following company up to 24 hours before the tour. Getting to know Vienna in a completely different way is a sightseeing tour with tourist buses. These buses run on 5 fixed lines (in winter 4 lines) with many stops, you can get on and off where you like and continue with a later bus. In total, the Hop-on / Hop-Off buses take you to almost all the important sights in Vienna, including the many attractions outside the city centre. As the departures are quite frequent, the waiting times are not too long. In the bus, you are informed about the next attraction via headphones. 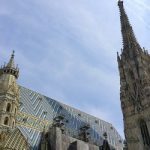 A city tour on foot in the city centre of Vienna is also included (in summer every day, in winter several times a week, for more details see the online booking at this website). There are tickets for the tourist buses for 1 day, 2 days or 3 days. This round trip through Vienna can also be cancelled free of charge up to 24 hours in advance by making an online booking via the well-known Getyourguide website. Since the double-decker buses take you to virtually all the important sights in Vienna, you save the public transport tickets. 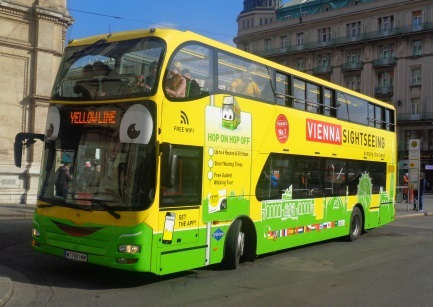 Examples of places of interest and other attractions that can be reached with the Hop-On-Hop-Off buses Vienna: Schönbrunn Palace including Vienna Zoo in the Palace Garden (oldest zoo of the world), Prater Amusement Park with the famous Ferris Wheel in the Prater, and Wax Figures in Madame Tussauds Vienna, UNO-City, Danube Island, Danube Tower, Augarten, Naschmarkt Market, Burgtheater, Hundertwasser House Vienna, Liechtenstein Palace, Vienna State Opera, many museums and much more. Of course, you can also visit all the important sights in the city centre on foot (Vienna Cathedral, pedestrian zone, etc.). In addition, there is the above-mentioned city walk on foot. You don’t necessarily have to do a guided tour of Vienna in a group. You can also rent your own guide. Advantages: On the one hand you have many more possibilities to ask questions. You can also decide on the content and focus of the city tour through Vienna yourself. You can also have your guide pick you up at your hotel or arrange another meeting point. With such individual city tours, you can usually determine the time and date of the tour of Vienna oneself. Disadvantages: If you book your own city tour through Vienna, you will of course have to pay a higher price than if you took part in a group tour. Our suggestion: This city tour, which can also be booked online, has very good reviews. In our opinion, the price is surprisingly low, starting at 50 Euro for 2 hours and depends on the number of participants and the length of the tour. You can book a guided tour through Vienna with your own guide for 2 hours or longer (up to 6 hours). Tour through the underworld of Vienna: excavations from the Middle Ages, tombs and the like. Interesting city tour for people who are interested in the history of the city. Guided tour Spanish Riding School Vienna: The Spanish Riding School is one of the most popular sights in the city. As a tourist you can watch the morning training with the horses (more on this page) or book a guided tour through the riding school in the city centre.